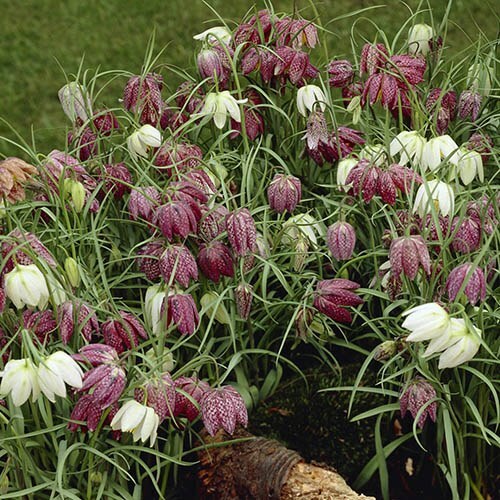 Fritillaria meleagris is also known as Snakeshead due to its unusual checkerboard markings. Ideal for creating border displays. A stunning mix of colours from purple to white. Supplied as a pack of 30 bulbs ready for planting. A stunning mix of colours from purple to white, fritillaria meleagris is also known as Snakeshead due to its unusual checkerboard markings. It has delicate bell-shaped flowers that hang and sway in the wind, and although beautiful and delicate looking, are remarkably hardy and will happily thrive in shady, woodland like spots. Ideal for creating border displays or for naturalising in shady spots under trees.